Thank you for joining us here again, as we delve into the age-old question, "Was Dr. Spock a groundbreaking pediatric genius, or a dangerous sociopath who derived secret pleasure from endangering infants?" 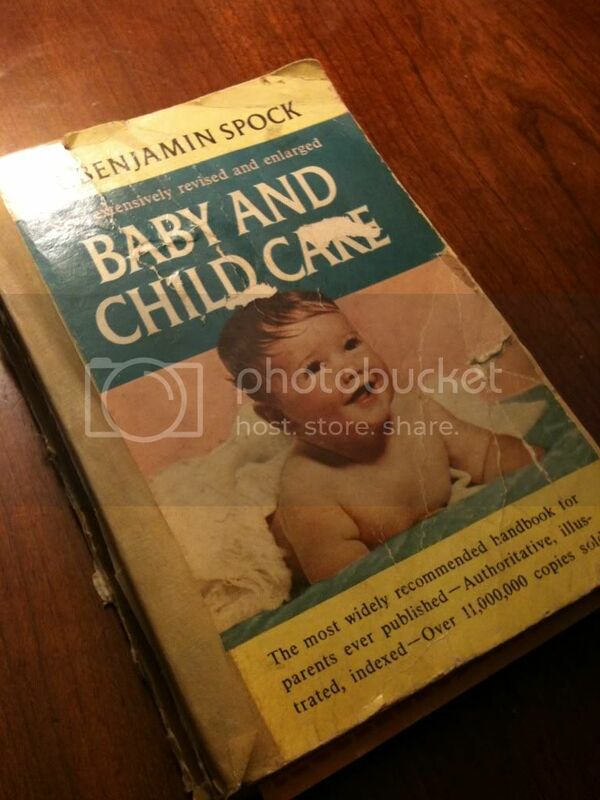 As before, in this series we'll be using Dr. Spock's bestselling book, Baby and Child Care, to research his recommendations on such subjects as "The Bowel Movements" and "What a School Is For." These are actual sections in his book, and are extremely helpful, especially if, for example, you don't know what a school is. Obviously feeding the baby should be counted among the things we do daily, or biweekly at least. Dr. Spock couldn't agree more. In fact, he quite nearly won't shut up about babies eating. He dedicates a hefty portion of his book to teaching us what babies like to eat and what they should eat and how to mix formula. If you've ever found yourself whipping up a batch of formula, you'll want to pay special attention here because Dr. Spock has a yummy recipe. Do you have a pen? Are you ready? Okay, the recipe is: any kind of milk + water + any kind of sugar. Mmmmm! Try canned evaporated milk and brown sugar, or powdered milk and corn syrup! Later today I'm going to make a refreshing beverage for Maddie out of Coffee Mate and Jolly Ranchers - I'll let you know how she liked it when we get back from the hospital. But what about solid foods? How do I know if my baby is getting the right nutrition? I hear you clamoring to know. Don't worry, Dr. Spock has researched this for us. 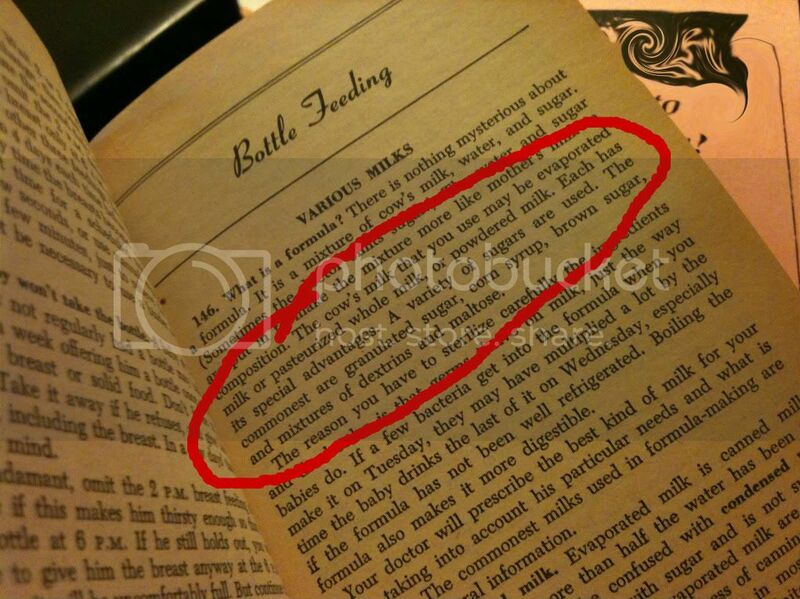 An Important Scientific Study was done to determine "what children would eat if left to their own desires" (pg 274). I could have easily told them the answer to that: candy canes, stuff they find on the ground, birthday cake, and chicken nuggets. But they didn't want to listen to me, so instead they took some 8-10 month old babies to live someplace where Scientists could keep an eye on them, then periodically set out a ton of food which nurses weren't allowed to feed to them until the babies "expressed their preference" by sticking their grubby hands into one dish or another. Do you know what they found out? They discovered that eventually, given enough time at a Boring Scientific Research Facility, babies will stick their grubby hands into almost any kind of food, which somehow or another translates into the baby choosing a healthy diet. Thanks, Science! I'm sure getting revolutionary Scientific Results like that was well worth traumatizing some babies, who probably weren't even given candy canes as an option. Enough of that - what do we do with our babies all day long when we're finished feeding them, if we decide to do so? Well for heaven's sake, get that baby some fresh air! Dr. Spock warns that staying indoors will make your baby pasty and sluggish. And who wants a pasty, sluggish baby? No one, that's who. To prevent that, just put your baby outside on the lawn for 2 or 3 hours a day - though Dr. Spock warns that an older baby might want company, so you shouldn't leave a child 6 months or older "out all by himself for more than an hour if he's awake" (pg 160). If he's sleeping, I guess you can just leave him out by the bird feeder all afternoon, if you want. But before you start thinking this Motherhood thing is a breeze and you can just chuck your baby out into the yard and eat bonbons for the rest of the day, think again - Dr. Spock has very specific and time-consuming instructions on how to give your baby a "sun bath," including turning him like a rotisserie chicken the whole time he's in the blazing sun in order to achieve a uniform Coppertone glow. It's too bad they didn't have tanning beds in the 1950s, as it seems they would have been an invaluable tool for mothers to more efficiently achieve that highly sought after Perfectly Bronzed Baby look. I'd like to help you figure out what you're supposed to do with your infant on A Typical Day once you dig him out from under the swarm of mosquitoes in the yard, but Dr. Spock just says that babies entertain themselves by looking at shadows, their hands, and pictures on the wall. Then, "each afternoon when the baby becomes bored with his crib, put him in the play pen" (pg 167). It sounds simple enough, but I'm starting to wonder if Dr. Spock spent very much time around actual babies. Maddie, for instance, has never spent one nanosecond awake in her crib when she was NOT screaming her head off. It doesn't matter how many pictures I hang nearby or how many times I tell her that she has hands - she doesn't care. The playpen is just as much of a joke. Maddie basically runs freely around the house like a shrunken little tyrant with a magnetic connection to electricity, except when she's climbing up my pant leg and demanding to be carried around. I have a feeling Dr. Spock would have some words to say about my parenting methods, though, so maybe that's my bad. Well, it's time for me to go locate my child in the yard and give her a bottle of half-n-half mixed with Skittles, so that's all for today. Tune in to future installments of "Dr. Spock: Childcare Guru or Deranged Maniac," when we'll tackle issues such as what to do with sick babies (boil them in Castor oil), how to deal with older kids (boil them in Castor oil), and how messed up our children will be if they aren't raised in a proper environment with a father who comes home at 5 PM with a briefcase and a mother who stays home and is always brushing a little flour off the edge of her apron (very). 1 Click below = 1 Vote! Then go outside and try to remember where you left your kid. It's probably illegal for me to read this since I don't have children but I'd like to point out that Spock was a Vulcan with no emotions which may explain why he suggests buying a hat as a cure for postpartum depression. Also, canned milk and brown sugar sounds good to me. PS-I wanted to tell you that I am moving my blog to WP (Yikes) next week, so follow me via RSS if you can:) I don't want to lose you as reader. Hope to see you on the link up this weekend too! Have a great rest of Thursday! Good point, TruckingT - that does explain a lot about Spock's apparent inability to make pro-human parenting suggestions. And I kind of agree with you about the canned milk and brown sugar. I'm a little surprised nobody sells that. It'd be like chai yoohoo. Hey Melissa, glad you liked it :). I followed you on email; I've heard so much about people switching to WP, I keep thinking I should look into it but it sounds SCARY! :) Good luck! Visiting from studio 30 and love this. following. and shall also buy a hat at once to cure my lingering depression. in bed, I bet Dr. Spock would be thrilled he was able to help you with his tip about hats! If he weren't so dead, of course. Thanks so much for reading and following - so glad you're here! Jeebus! I'm thinking Mr Spock would be better at parenting the Dr Spock! At least the Spock with pointy ears was all about living long and prospering. You're right, Eric - Dr. Spock doesn't seem to be so into the living long thing. Plus he couldn't mind meld - score 2 for pointy-eared Spock. Naked Girl - for real! That pretty much sums it up. Kimberly, you're right - there are SO many books out there on the subject, but there's really no substitute for experience and your own intuition. Guess Dr. Spock never heard of skin cancer and that sun screen is not recommended for children less than 12 months old. Bet hey, a nice sunburn is better than pasty and sluggish right???? Just Keepin It Real - ha! That's right - when I read that I couldn't believe I've been letting my baby run around all pasty. She doesn't even have any proper tan lines. Embarassing.